El Salvador is located in Central America, bordering the Pacific Ocean between Guatemala and Honduras. It lies on the Gulf of Fonseca, as do Honduras and Nicaragua further south. The capital city of San Salvador is the largest city of the republic. El Salvador is the smallest and also the most densely populated country in Central America. 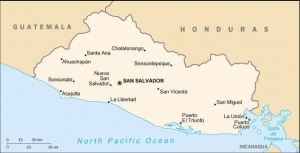 The total area of El Salvador is 21,040 km2 (8,124 square miles) and in July 2010 the population was estimated to be 6,052,064. The population is 85% Mestizo, 12% White/Caucasian, and 1% Amerindian (Pipil, Lenca). According to a survey in 2008, 52.6% of El Salvador's residents are Roman Catholic and 27.9% are Protestant. Three Mennonite groups were active in El Salvador in 1986: the Iglesia Evangélica Menonita (Beachy Amish), the Iglesia Menonita de El Salvador (Metapán), and Mennonite Central Committee (MCC). The Iglesia Evangélica Menonita was begun in 1968 following six years of social service work in cooperation with the government. Seventy-five members meet in six locations in central and western El Salvador. In addition, the churches supported a variety of social service projects including an orphanage, day schools, and refugee programs. The Iglesia Menonita del El Salvador (Metapán) is related to the Iglesia Evangélica Menonita of Honduras (Honduran Mennonite Church) begun by Eastern Mennonite Board of Missions and Charities workers. The congregation in Metapán began when Salvadorans living in Honduras were repatriated after the 1969 war between the two countries. The church has grown from a few members to more than 100 and erected a building in 1982. Now it is planting churches in nearby communities. Central Intelligence Agency. 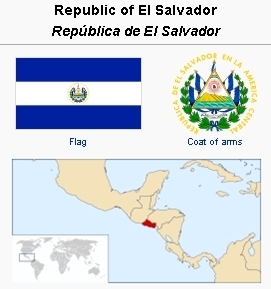 "The World Factbook: El Salvador." 27 October 2010. Web. 30 October 2010. https://www.cia.gov/library/publications/the-world-factbook/geos/es.html. Horsch, James E., ed. Mennonite Yearbook and Directory. Scottdale: Mennonite Publishing House (1984): 133, 169. Mennonite World Conference. World Directory = Directorio mundial = Répertoire mondial 2012: Mennonite, Brethren in Christ and Related Churches = Iglesias Menonitas, de los Hermanos en Cristo y afines = Églises Mennonites, Frères en Christ et Apparentées. Kitchener, ON: Mennonite World Conference, 2012: 21. Mennonite World Handbook Supplement. Strasbourg, France, and Lombard, IL: Mennonite World Conference, 1984: 73. Wikipedia. "El Salvador." Web. 30 October 2010. http://en.wikipedia.org/wiki/El_Salvador. Flickinger, Ron. "El Salvador." Global Anabaptist Mennonite Encyclopedia Online. October 2010. Web. 19 Apr 2019. http://gameo.org/index.php?title=El_Salvador&oldid=121802. Flickinger, Ron. (October 2010). El Salvador. Global Anabaptist Mennonite Encyclopedia Online. Retrieved 19 April 2019, from http://gameo.org/index.php?title=El_Salvador&oldid=121802. Adapted by permission of Herald Press, Harrisonburg, Virginia, from Mennonite Encyclopedia, Vol. 5, p. 267. All rights reserved. This page was last modified on 29 April 2014, at 04:12.